Well, it's been a long time since I have done an update. I have been so busy lately that I haven't had much time to research anything for the community works section, but I wanted to come here and fill you in on some of the progress we have been making. If you haven't heard already, we have an expansion in the works. Yes, it's true! 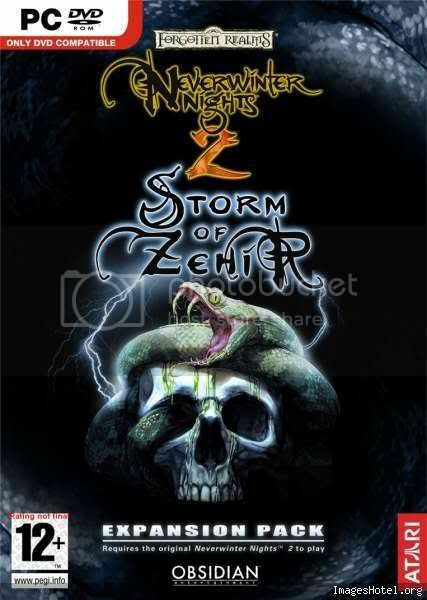 The expansion (which we refer to as NX2) is titled Neverwinter Nights 2: Storm of Zehir. With this expansion we will be doing some things that haven't been done in a Neverwinter game before. Things are moving along pretty well on NX2. We just hit Alpha and we are pressing on to Beta, with a few internal milestones in between. One of the cool things to happen with NX2 is that the Snake & Skull image will appear on the box. This is the first time a full-color image will appear on the box art for a Neverwinter Nights game. The team has been working hard on some great improvements to the game. Probably the biggest of these improvements is the Overland Map system. In previous incarnations of NWN2, players warped around the world by selecting nodes on a 2d map. In many ways this broke the immersion of the game. With SoZ, players will negotiate their way around the world through the use of the overland map - which has a special UI done by Jay Bakke and Nathaniel Chapman to further set the map apart as a different section of the game. I expect you will be seeing more screenshots of this after GenCon. One of our goals with NX2 is to make some of the less utilized skills more meaningful. The overland map really helps support this goal by presenting the player with a lot of random monster, treasure, dungeon and quest spawns - many of which will only be encountered by characters with certain skills and feats. For instance, characters with a high enough score in the Listen skill will be rewarded with a "hissing box" encounter. If you have enough points in the Disable Device skill you will be rewarded with a trap encounter, where the parts of the trap can be recovered and sold. Another new set of features are the party creation and party conversation systems. Like the overland map, the party creation system is a groundbreaker for the Neverwinter franchise: For the first time, players will be able to create their party of four completely from scratch in a Neverwinter Nights game, with the same character creation capabilities as you have for your own player character. We will round the party out occasionally with a couple story-based companions, but the created party will be the core of the game. To go along with the party focus, Anthony Davis has been hard at work implementing the Party Conversation system. This new feature will expand the party-based feel of the game by allowing players to capitalize on the skills and backgrounds of the entire party, not just the party leader, as in previous NWN2 and NWN1 titles. Based on each character's skills and background, different conversation options will be available simply by selecting a different party member's portrait in the conversation. Something else we are doing with NX2, that hasn't really been done in a while with CRPGs is we will be recording a lot of the music from a live orchestra. Unfortunately I don't have any samples to share with you now, but we are talking about making a track or two available, just like we did with Mask. I am pretty excited about the changes and features Storm is bringing to the franchise. From box art to gameplay the game is evolving. The fine print: As this game is still in development, features and functionality may change or be removed before release. Obsidian always had good tastes for music. KotOR2 and MotB were quite impressive from this point of view. Looking forward to some samples. How will the new "party" concept affect the "main PC" when it comes to scripting? At the moment, I have invested quite some time scripting around the player having a main PC with companions. Will the coding effectively be the same? i.e. Will the player still have a Main PC (their first one created perhaps?) via which we access the others (who may simply be "improved companions" by comparison)? There will be flags to identify between the main PC, player-made NPCs and the cohort NPCs we provide. After giving it some more thought, I guessed you must be working around the functions already in place somehow, or else ones such as GetIsOwnedByPlayer would cease to work if every PC built by the player was considered a "main" one. Therefore from a scripting point of view, I take it from what you said that the "Main PC" will still be the very first one that the player builds for their game, and that additional ones made for the party after that will still be "companion" status as such, even if the player considers them all part of their "main party". And I presume that this status of "Main PC" for the first PC cannot be changed by anything the player does, even though there is the illusion that all their PCs are "main". I think part of my confusion was the way the new package was being "sold". But, by the sounds of it, it is still (in principle) a "main PC" with companions. Please correct me if I have misunderstood. EDIT: This new expansion sounds really great by the way: I look forward to buying a couple of copies for my wife and I to play with the gang. Symphonic orchestra, that will be awesome for sure, and quite a change with the more synthetic soundtracks we had so far. And, being Alpha soon means the Expansion could even be ready before Christmas with a bit of Luck, quite nice. Wow, full-color box art? as opposed to black and white, or maybe just two or three colors? --super. Obsidian, we truly don't deserve you. Also, I loved the post/warning on Bioware on how your customers are hate mongers. And the interview question on whether your fans are holding you back. Fantastically out of touch with reality. While I'm on the rant, 4ed sux0rs and will be the demise of the DnD franchise. After finishing the core manuals I felt bloodied so I spent my action point on a healing surge and chucked that refuse into the waste bin. How will be made the dialogs with companions, when player can chose their class ? will there be fixed gender and some manners ? give us in some patch: invert vertical mouse axis in strategy camera mode. there is that option in character mode, but why there isnt in strategy mode ? i think i am not only one person who would like it. Thank you for all. And keep up great work. - The level cap to 30th level is an utter and complete ... . In Neverwinter Nights 1, the level cap was hard coded to 20 and then moved to 40. You have left the level cap to 20 in NWN 2 and brought it to 30 in MoTB...and in SoZ. when Microsoft tried to dump its Vista down the throat of its customers, not giving a damn about their desires...*the same*...how could you give your customers less than that was given them in the outdated NWN 1?? "not polished"...it's like when you work an make your nightmarish "work worksheets" in Excel...but well...I have the decency to not give to other people my work worksheets...what really makes my ... drop is that you actually SOLD it like that!! your character's face should be so limited and the options so depressing? In the end I've chosen the wood elf, since with it I've found one of the few non-ugly faces in the game. - Your companions are static...they don't change when you put a different helmet and in some cases not even when you change their armor. Now I have a 21th level character and I am starting Mask of the Betrayer, but if I think that I cannot make my perfect combo build because of your blasted 30th level cap I feel truly depressed and I feel like moving back to NWN 1...and well...may be you guys think "Who cares? "...well...you should care for disatisfied customers *won't* buy your next expansion if you disatisfied them in the previous games! !